Piano Polishes - 8oz Bottles is rated 4.18 out of 5 based on 41 ratings. Hi-Gloss Finishes: Super High-Gloss Piano Polish is specially formulated to clean and protect high-gloss polyester, polyurethane, and lacquer finishes in one easy step. Use Super High-Gloss Polish as often as desired to eliminate fingerprints, smudging and static that attracts dust. Special UV Shield protection helps prevent fading and surface deterioration. 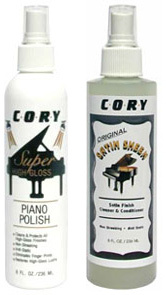 Satin Ebony Lacquer Finishes: (commonly seen on American-made pianos such as Steinway and Baldwin) Satin Sheen helps maintain satin finishes easily. Works on poly as well as lacquer finishes. Use Satin Sheen to remove fingerprints, smudges and grime. Use regularly to reduce static and protect against fingerprints and oils. Simply apply to the surface, rub in direction of grain and buff off. Lacquer Finishes: (commonly seen on American-made pianos such as Steinway and Baldwin) All-Brite is a moisture enriching formula designed to polish and condition all fine wood surfaces. Use All-Brite on all satin, lacquer, shellac, and open pore woods. The polish keeps wood from drying and cracking while it adds a beautiful luster to the finish. Simply spray on and wipe into finish.